In northeast Limestone County lies Mexia, a small town which sprang up once the railroad arrived in the early 1870s. Mexia’s economy in its early days was based exclusively on agriculture, especially cotton. Due to the arrival of the railroad and the business opportunities that came in its wake, Jews began arriving in Mexia around the time of the city’s founding. Though no Jewish house of worship has ever been built in Mexia, the city’s Jewish residents, especially the Nussbaum family, have made a huge civic and economic impact on the city. As the railroad came to Mexia in 1871, Jewish businesspeople began arriving as well. Perhaps foremost among them was German-native Joseph Nussbaum, one of Mexia’s first merchants, who arrived in either 1869 or 1871. Nussbaum would go on to become one of the Mexia’s leading citizens and a driving force behind the city’s industrialization. In his early years in town, Nussbaum opened a general store selling dry goods, groceries, and other merchandise. Nussbaum was possibly the first Jew to settle in Mexia, whose Jewish population numbered six families by 1879. In 1873, the same year Mexia was incorporated, brothers William and Henry Kamsler built the first brick building in town, a dry goods store. Their firm Kamsler and Brother also had a buying office in New York. William also served on the five-man financial committee of Texas Mutual Endowment and Aid, an insurance company based in Mexia. Morris Mindek and Dave Katten, natives of Louisiana, both arrived in town by 1880, and found work as clerks. Katten later formed a grocery with his brother Simon. In the early 1880s, two men who would go on to find success in their adopted home of Mexia arrived and entered into business with Joseph Nussbaum. One was Julius Nussbaum, Joseph’s brother, who arrived in Mexia in 1881. Starting as Joseph’s bookkeeper, Julius later became a partner in the firm and a prominent local businessman. Julius Desenberg arrived in 1883 and also found work with Joseph Nussbaum. In 1900, the two Juliuses founded the Desenberg-Nussbaum Company, which sold supplies to local farmers. It also acquired land, renting it out to farmers and buying their produce. The company remained in business until the early 1920s. Jews arriving in Limestone County following the arrival of the railroad did not settle exclusively in Mexia. Some settled 12 miles away in Groesbeck, or other surrounding towns, but were buried in Mexia’s Jewish cemetery. For example, by 1880, Russian-native Abraham Levingston worked as a merchant in Groesbeck. Joseph and Julius Nussbaum’s brother, Sol, arrived in Groesbeck in 1885 and later entered into partnership with B.H. Marks. Marks was a German native who arrived in Limestone County by 1900 and, after working as a merchant and grocer in Mexia, moved to Groesbeck in the 1910s. Around 1890, Marks sold his share in Nussbaum and Marks to Louis Scharff, Nussbaum’s brother-in-law. Scharff arrived in Groesbeck in 1890 after working in Mexia for two years with Julius and Joseph Nussbaum. Scharff then partnered with Julius and Sol in the operation of their successful dry goods firm, renamed Nussbaum and Scharff, Inc. and also partnered with Sol in a hardware company, Oliver, Nussbaum, and Scharff. Scharff was one of Groesbeck’s prominent citizens, serving on both the school board and the city council. By the early 20th century, more Jews settled in Mexia and the town’s Jewish population reached an estimated 45 individuals in 1907. Charles Green arrived in town in the late 19th century, as did Isidore Newman, followed by Missouri-native and jeweler Emil Meyer in the 1900s. After working as a clerk in a dry goods store, Newman became Mexia’s postmaster in 1909 and again in 1921, serving as a grocery merchant in the intermittent years. In 1910 the Mexia Weekly Herald noted humorously that Postmaster Newman had received a Jewish calendar from Jerusalem but, probably because the calendar was in Hebrew, he was unable to read it. In the late 19th and early 20th centuries, Jewish businessmen played a key role in the industrial development of Mexia. By 1885, a gasworks had been built in town and Joseph Nussbaum’s company had erected an opera house. With Joseph Nussbaum as a stockholder, an ice and electric light factory and a water facility were also constructed. 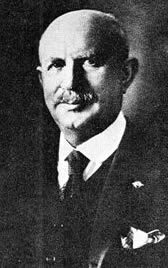 Nussbaum also owned a bottling company and was a stockholder in the First National Bank, where he served as president; his brother Julius served as vice president and director. Joseph’s son, Emile, also became a banker. Following his service with the Army’s finance department in World War I, Emile Nussbaum helped organize City National Bank, becoming its vice-president. Julius Desenberg also helped organize City National Bank, and he went on to serve as the bank’s director, vice president, and chairman of the board. Louis Scharff’s son-in-law, Sam Suravitz, became bookkeeper and later manager of the company Joseph Nussbaum had helped found, Central Texas Ice, Light & Water Company, which provided electricity to Mexia and the surrounding towns. In addition to their leading economic role, Mexia’s prominent Jews were active in civic affairs. William Kamsler was elected city treasurer in 1888. Joseph Nussbaum was a Mason, a charter member of Mexia’s lodge of the Knights of Pythias, and participated in various charities. Julius Nussbaum also was a Mason and served as a town alderman. He also served on the board of the Mexia Chamber of Commerce. Desenberg was known for his philanthropy and served many years as the trustee of Mexia's public schools. By the turn of the century, the Jews of Mexia had begun organizing Jewish institutions. On May 1st, 1895, Jewish women in town founded a Ladies Hebrew Benevolent Society. The society, which had 13 members in 1900, was responsible for the upkeep of the local Jewish cemetery. The cemetery’s founding date is unclear, though the earliest grave is that of Abraham Mindek who died in Mexia in 1874. In November 1899, a weekly Sunday school, with one teacher, two classes, and ten total students was formed. This school was apparently short-lived because in 1904 Rabbi Alfred Godshaw, assistant director of circuit work for the Union of American Hebrew Congregations, visited Mexia and, according to the local newspaper, organized a Sunday school. The newspaper also announced that Rabbi Godshaw had organized a congregation which would hold services on Jewish holidays and possibly other occasions. Joseph Nussbaum kept a Torah in his home, hosting services there. Since he could read Hebrew, Nussbaum most likely led the services as well. The formation of the congregation (whose name, if one existed, is unknown) in 1904 did not mark the beginning of religious observance by Mexia’s Jews. In September, 1899, the Mexia Evening Ledger carried the announcement that the Hebrew population took “a holiday” in honor of Rosh Hashanah and that, in observance of Yom Kippur, all Jewish stores would remain closed. A similar announcement in 1906 informed readers of the State Herald that Mexia’s Jews would be observing the Day of Atonement in their homes. In 1908, notice was given that all Jewish owned stores would be closed for the first day of Rosh Hashanah. However, by 1913, a Mexia Weekly Herald notice only announced the closing of Joseph Nussbaum’s store for the High Holidays. In 1920, Joseph Nussbaum and Co. was the only Jewish store to advertise its closing for the holidays. The Jewish community had begun to shrink; by 1919, an estimated 26 Jews lived in Mexia. When in need of a rabbi for a religious ceremony, the Jews of Mexia would usually rely on a traveling rabbi or one from a larger city. For example, when Miss Willie Kamsler, daughter of William, a “popular young lady, not only in Jewish circles, but with all her many friends,” was married in Mexia in 1899, Rabbi Kohut of Dallas’ Temple Emanu-El officiated. Alternatively, Mexia Jews might travel to another city as Sadie Green did, marrying in San Antonio in 1909. In 1910, Beulah Scharff and Jack Nussbaum married in New Iberia, Louisiana, where Scharff’s mother lived; Rabbi Max Heller of New Orleans conducted the wedding. Similarly, for the High Holidays, Mexia’s Jews might travel to a larger city nearby, as dry goods salesman Gus Shaw did in 1910, spending Rosh Hashanah in Waco. The Jews of Mexia did not remain an insular community. The society columns in local newspapers are replete with the comings and goings of the town’s prominent Jews. They would travel to and from Groesbeck to visit friends or relatives and host parties with Jewish and non-Jewish visitors from other Texas towns such as Corsicana, Dallas, Galveston, Houston, Hubbard, and Marshall. In nearby Corsicana in the late 19th century, oil and natural gas were discovered below the earth’s surface. In 1912, a group of Mexians formed the Mexia Oil and Gas Company hoping to make a similar discovery in their town. Julius Nussbaum and Julius Desenberg were among the original incorporators. Later, Nussbaum served as its president while Desenberg was secretary-treasurer. The company drilled ten dry holes before discovering a gas deposit on their eleventh attempt, enabling them to supply Mexia and surrounding towns with natural gas. This discovery of natural gas paled in comparison to the short-lived oil boom of the early 1920s. In 1920, 3,482 people lived in Mexia. 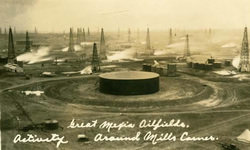 The following year, oil was found in Mexia and the city’s population exploded, quickly reaching almost 35,000 people. 1922 proved to be the peak year of Mexia’s oil production and by the mid-1920s the city’s population had leveled out at around 10,000 people. Mexia’s rapid growth, however, had not taken place without the presence and investment of Jewish businessmen. The first well to produce oil was the Western Oil Corporation’s No. 1 Desenberg, possibly named after Desenberg because it may have been located on his land. Desenberg and Joseph and Julius Nussbaum had all accumulated large amounts of land since their arrival in Mexia. Much of Mexia’s oil came from their property, especially that of Julius Nussbaum. Only a decade after the oil boom, Mexia’s three Jewish titans of industry passed away within a span of three years. Julius Desenberg died in 1933, Julius Nussbaum in 1935, and Joseph Nussbaum, who had begun spending much of his time in Galveston and San Antonio, in 1936. As all three had played a key role in the development and growth of Mexia, their loss affected the entire community, as evidenced by a headline in the Mexia Weekly Herald in 1933: “All Mexia Mourns Death of Julius Desenberg.” Desenberg and his two business associates are buried in Mexia’s Jewish cemetery. However, their deaths did not mean an end to the Jewish presence in the city. By 1930, new Jewish merchants to Mexia included Sam Nedler of Romania, who owned a dry goods store, and Polish-born brothers Jake and Louis Altman, who operated The Famous Dry Goods Store. An estimated 28 Jews still lived in Mexia in 1937. Stores owned by Jews in Mexia in the early 1950s, as evidenced from a notice of stores closing for Rosh Hashanah in 1952 in the Mexia Daily News, were: The Famous, Macray, Jacobs Brothers, and K. Wolens. An active Jewish presence remained through the 1970s, as Claude Nussbaum, son of Julius, co-officiated at the 1975 funeral of Kurt Damberg, a Jew who had fled Nazi Germany in 1940 and come to Mexia in 1968. Today, a few Jews, many of them descendants of one of the Nussbaum brothers, remain in Mexia. The older generations have either died out or their children have moved away, most likely to larger cities in Texas. The cemetery, however, abounding in Nussbaums, remains in use, with burials dating as recently as 2008 and 2009. The Jews of Mexia, especially Julius Desenberg and the Nussbaum family, have made a remarkable impact on their town.